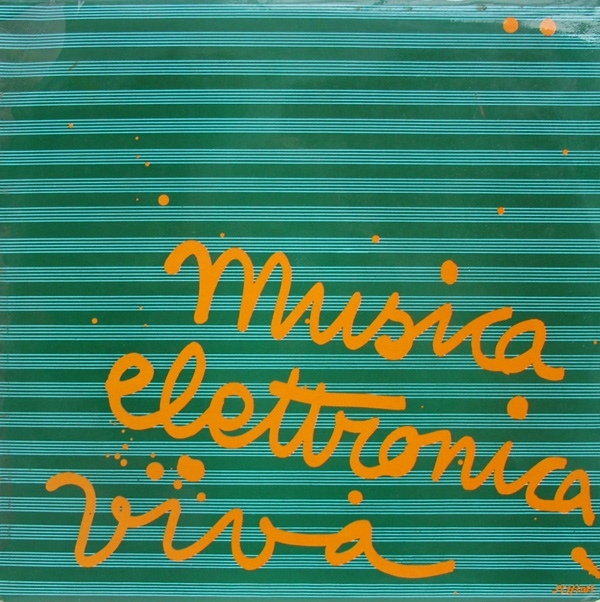 Musica Elettronica Viva was an odd and amorphous group whose vision of collective free improvisation, like that of their British peers AMM, presaged many of the developments of avant music in the ’70s and beyond. The group’s membership shifted constantly around a core of American expatriate composers living in Europe: particularly Alvin Curran, Frederic Rzewski, and Richard Teitelbaum. MEV had been active, in one form or another, since 1966, when they were formed in Rome by Rzewski, Jon Phetteplace, and Allan Bryant, with Curran and others joining soon after. Although initially an ensemble dedicated to performing compositions by the various members, they soon evolved towards free improvisation, playing live music that mixed primitive electronics, conventional instruments, and non-musical objects and devices. Friday, recorded in London in 1969, was the first LP to appear under MEV’s name. The group here consisted of Rzewski, Teitelbaum, Curran, saxophonist Gunther Carius, and trombonist Franco Cataldi. It’s raw, crude music, plodding and often frankly uninteresting – generating musical interest in any conventional sense seems to be somewhat beside the point of the group’s aesthetic. The LP consists of a single 40-minute live performance, split across the two sides, and it’s dominated throughout by a droney, hazy, indistinct quality. It’s music that seems calculated not to make an impression, to form a background buzz in which sounds blend lazily together, and even the most unpleasant noises simply become another component of the overall drone. The album opens with a bed of low, rumbling noise backing repetitive horn figures. The horns, slightly rough around the edges, obviously stand apart from the electronic elements but also don’t sound any more overtly “musical” than the backdrop: the two horns in the intro (presumably Curran’s flugelhorn and Cataldi’s trombone) either sound long droning tones or staccato phrases that hammer insistently on the same note without variation. Gradually, Rzewski’s piano fades into the mix, its sound hollow and brittle, surrounded by the droning electronics and the occasional feedback squeal. This is the most compelling stretch of the album, as the piano plays a minimal melody that blends at its edges into the surrounding morass. Around 9 minutes in, the piano finally gets swallowed up completely by the dull sizzle of the electronics, and the horns trade phrases for a while, sounding intentionally harsh and ugly. A voice speaking about “making love” rises out of the mix and gets looped, accompanied by the clicking sound of tape recorder buttons being depressed. In the piece’s second half, things grows even more monotone and droney, with electronics mingling with held horn notes, and Rzewski dropping lonely-sounding piano clusters into this desolate, creaking landscape. It’s gray, cold music, probably intentionally so. All the sounds are thin and distant, and only occasionally does the music swell to life, cresting in waves of noise before subsiding back to its base state, the weak throb of machines sputtering on the edge of failure. MEV’s debut has not retained its power after all these years. They were pioneers, heavily influenced by the innovations of John Cage and David Tudor with electronics and contact mics, and they expanded upon those ideas in new contexts. No one sounded quite like them at the time, if only because no one else had the same technology. (In at least one way, that was literally true: Teitelbaum’s Moog synthesizer was the only one in Europe at the time.) As is often the case with pioneers, the passage of time has not been kind to what now sounds like a rough, amateurish experiment – which, to be fair, it was. Even so, Friday has its moments of interest, though they’re often fleeting. One of the strongest sections comes near the end of the album, when much of the noise drops away to put the focus on what seems to be a sample of someone whistling in a train station, the breathy tune accompanied only by the rumbling of trains and, playing alongside the looped sample, Rzewski’s piano. It’s a simple passage, but a disarmingly effective one, juxtaposing that slice of external reality with the mournful tones of the piano, with minimal noise or processing to distract from the tension that results. Unfortunately, this exchange leads seamlessly into a busy, chaotic finale in which that sample gets chopped-up and layered with noisier interjections from the rest of the group, shattering the gentle balance that had existed for a few minutes there. That conclusion is indicative of the group’s sometimes shaky improvisational instincts. Elsewhere, Friday simply drifts into the background, which is preferable to that kind of attention-grabbing poor taste, but still isn’t too interesting. This may have been a bold, even shocking debut in 1969 – the group reportedly prompted riots and harangues from angry concert attendees – but today it’s hard to hear what could’ve been the fuss about these indistinct drones. This entry was posted in 1969, free improv and tagged Alvin Curran, Franco Cataldi, Frederic Rzewski, Gunther Carius, Musica Elettronica Viva, Richard Teitelbaum. Bookmark the permalink.